Posted in: Uncategorized. Tagged: Afghanistan, Chicago Air and Water Show, Drone Warfare, drones, No Drones Illinois, Obama, Occupy Chicago, Pakistan, Protest, Somalia, WorldCan't Wait, Yemen. On Saturday August 18, among the crowds and the roaring aircraft at the annual Air and Water Show on the shores of Lake Michigan, about 50 Chicagoans from various organizations stepped up to counter the glorification of illegitimate and immoral U.S. wars and the advanced weaponry used to perpetrate them. 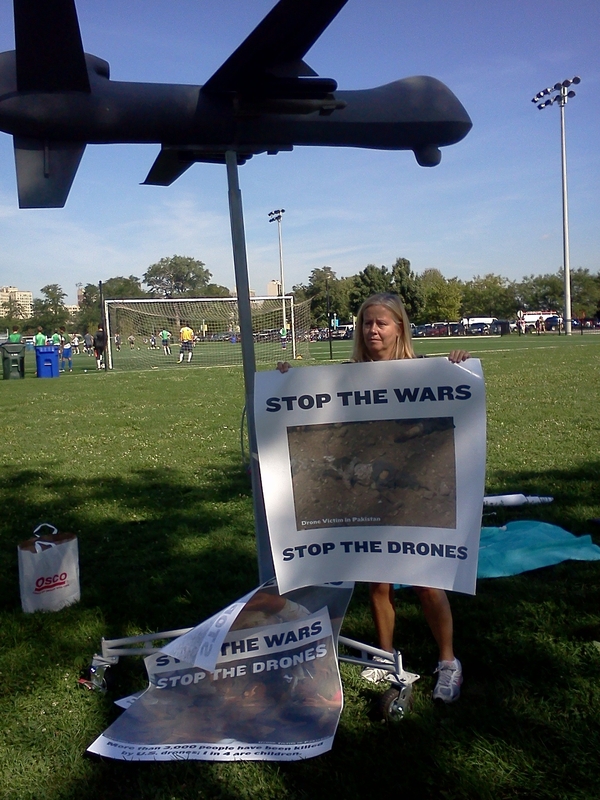 Drone warfare and the thousands of innocent civilians killed by drones in Afghanistan, Pakistan, Yemen, and Somalia were a special focus of the protesters. Among the organizations participating were Chicago FOR (Fellowship of Reconciliation) , Chicago World Can’t Wait, Occupy Chicago, No Drones Illinois, Pakistan Federation of America Chicago (USA), Protest Chaplains Chicago, and Wellington Avenue United Church of Christ. 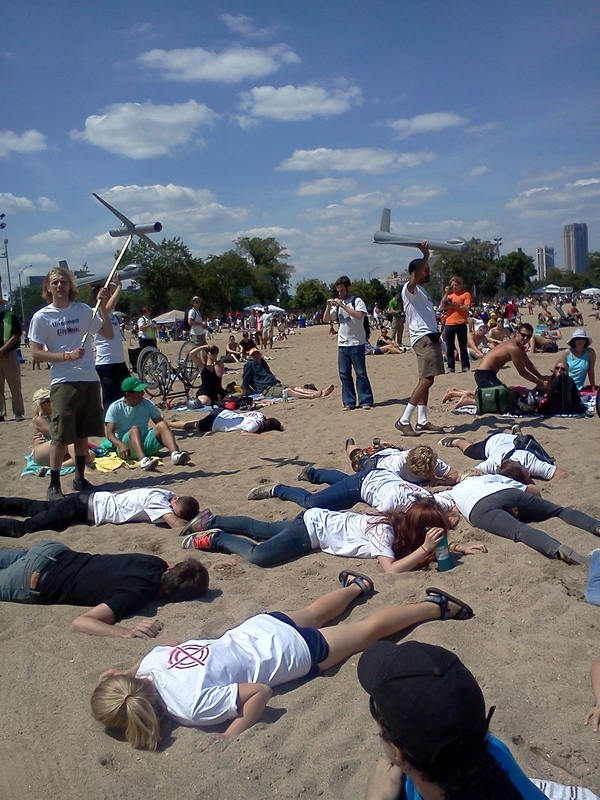 While Occupy Chicago performed multiple die-ins along the beach to highlight the brutality of drone attacks and represent those killed by these deadly attacks, World Can’t Wait and friends passed out brochures that explained what drones are and showed the reality of what the U.S. wars are about. The brochure was also aimed at young people who are preyed upon by military recruiters – a major presence at the Air & Water Show – with information on how youth can resist recruitment and U.S. wars for empire through World Can’t Wait’s project We Are Not Your Soldiers. Occupy Chicago performs a die-in at the Air and Water Sow. Some participants wore white T-Shirts with targets on their backs while others held aloft model drones. These die-ins were performed several times up and down North Avenue Beach. * “Die-in” street theater along the beach was very powerful and reached many hundreds.of spectators. * The model drone was a great way to engage people in conversation about the realities of drone warfare. The drone model did attract a lot of people who probably wouldn’t have stopped for anti-war protesters alone. Some people knew quite a bit about drones and were alarmed about them, while others repeated the line that they’re okay because they “save American lives.” We had a lot of conversations about what’s wrong with that! But most were almost completely ignorant, so our 4 page brochure was important. One young graduate student from Pakistan came over to the drone model expecting to meet US military personnel explaining how great they are. He was so taken aback to find us with our enlarged pictures of victims of drone attacks calling for an end to drone warfare and wars for empire, he took pictures and said he was sending them to friends in Pakistan as we spoke. He also contributed to help pay for our expenses. The die-in was great! The message was powerful and provocative. While some who disagreed with our message chanted “USA! USA!,” other people applauded each time we finished (the die-in was done at least 10 times up and down the beach AND in front of the recruiters’ stands) and some people came up to find out more about what we were doing. One woman thanked me and said her daughter was getting out of the military after 20 years and she (the daughter) was disgusted with all the lies and propaganda about the wars, which they both thought were “unwinnable.” She said she had been a Republican, then supported Obama and now realized none of them would end these wars.